According to Reuters, an named Israeli official went to Qatar to raise funds for a settlement in the Gaza Strip, Israeli media said. “Israeli figures traveled to Qatar for talks so that there would be someone financing for all these agreements,” said Roni Daniel, a military commentator for Channel 12. In June 2017, the occupation government acknowledged for the first time that Hamas had four Israeli prisoners. Commenting on the information, Ahmed Yari, commentator on Arab affairs in the channel, said: “There are topics that Hamas will gladly agree to provide the Gaza Strip with gas. In a related context, the security commentator in the Channel 10, the tenth, that the Crown Prince of Abu Dhabi, Mohammed bin Zayed, participate in the agreements that crystallize with Hamas within the Egyptian plan for an agreement in Gaza. 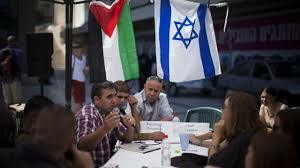 The plan includes the immediate start of negotiations on the prisoners exchange deal,” an Israeli official said. “A senior Israeli official informed us of contacts between Egypt, the UN envoy, Hamas and the Palestinian Authority that the Egyptian plan for an agreement with Gaza includes the immediate start of negotiations on a prisoner exchange deal between Israel and Hamas,” said Barak Rapid, And within the framework of discussing the issue of the bodies of soldiers and Israeli citizens detained by Hamas. A delegation from the Hamas movement abroad and the West Bank arrived in Gaza from Cairo, including the deputy head of the political bureau of the movement Saleh al-Arouri and its president abroad, Maher Salah, and members of the political bureau, to discuss the Egyptian initiative to ease the siege of the Gaza Strip and establish a truce between resistance and occupation. The delegation of Hamas and Fatah visited Cairo on 31 July 2018 at the invitation of the Egyptian authorities to discuss developments in the Palestinian issue, achieve reconciliation and end the division and face the “deal of the century” and the law of racial nationalism, in addition to ways to lift sanctions on the Gaza Strip.